MSI Bluetooth Star Hub is designed to provide a solution for both Bluetooth connectivity and USB 2.0 hub function. By integrating a Bluetooth module, it becomes a Bluetooth-enabled USB hub. 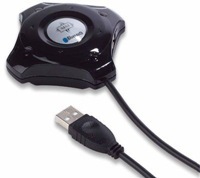 It extends one USB port of your PC to 3 USB ports and 7 Bluetooth device notes. It also fully supports Wide Range Self Power Mode for USB 2.0/1.1/1.0 Devices. A wide range of compatible profiles enable Bluetooth Star Hub to communicate with Bluetooth mouse/ keyboard/ game pad, and exchange your favorite photo/music files with Bluetooth embedded cellular phone and handheld device.